February 14th Women's Memorial Marches are held annually to honour women and girls who have been murdered or have gone missing in Canada. The first community march was held in 1991 in Vancouver, following the murder of a local indigenous woman in Vancouver's downtown Eastside. 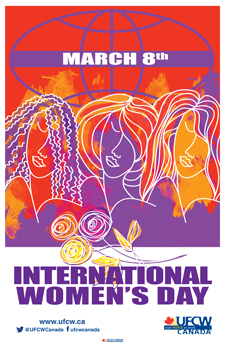 Since then, marches have been held annually across the country to call attention to the more than 1,100 murdered and missing indigenous women and girls reported in Canada since 1980.
International Women’s Day (IWD) is celebrated annually across the world on March 8. The day commemorates and celebrates the contributions women have made around the globe and calls us to renew our pledge to accelerate gender parity across the country. Nationally, it arose from the struggles that women faced at the turn of the century, when population growth and a change in working conditions saw many women in the workforce, facing long hours, minimum pay and no right to vote. International Women's Day is marked with the thousands of events that occur to celebrate the economic, political and social achievements of women. For more information on some of the events happening to celebrate International Women's Day, please visit www.internationalwomensday.com. This day marks the additional months women have to work in order to earn the salary men make in one calendar year. In other words, the average Canadian woman will have to work three and a half months into the new year to earn what men do by December 31 of the previous year. The gender wage gap is the reality for working women across the country. Women of colour, Indigenous women and women with disabilities face the worst gender wage gap. Thanks to the labour movement, this pay gap is already much less for women with unions, but income equality for all working women is the ultimate goal. Equal Pay Day, April 9 across Canada, helps us raise awareness about the gender pay gap and how to close the gender pay gap for all working women. 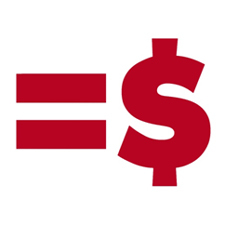 This year, let’s ensure that Equal Pay Day is celebrated from coast to coast. In 1992, October was proclaimed Women's History Month to acknowledge and celebrate the achievements of women throughout Canadian history. 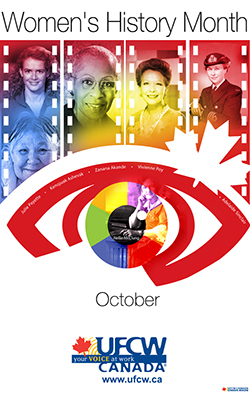 October was chosen to coincide with anniversary of the Persons Case, which on October 18, 1929 – through the courage and determination of the Famous Five, the five Canadian women who launched the case – established once and for all that women were "persons" when the Privy Council overturned a Supreme Court of Canada decision and ruled that women were indeed persons, and could become Senators. The ruling not only opened the political doors for Canadian women. It also clearly asserted that women's equality rights in Canada were fundamental. The Sisters in Spirit vigils honour the lives of missing and murdered Indigenous women and girls. It is also a day of support for families who have been tragically touched by the loss of a loved one to violence. Vigils take many forms; rallies, candle-light vigils, workshops, a moment of silence, a walk, or a gathering of people in solidarity to share memories. Violence against women is the world's largest and most persistent human rights violation. Over 50% of Canadian women will experience an incident of violence at some point in their lives, the majority before they turn 25. On November 25 - the International Day for the Elimination of Violence Against Women, join UFCW and YWCA and show your support to end violence by uploading your #NOTokay posting for a Twitter storm at 12 noon EST. We hope that we can surpass our engagement this year by strengthening our online presence on Twitter and Facebook. 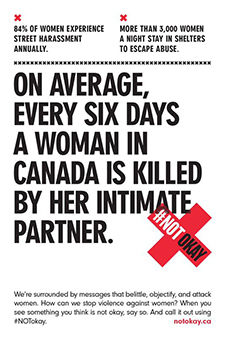 Please remember to include @UFCWCanada and the campaign hashtag #NOTokay in your tweets. On Facebook, don’t forget to tag @UFCWCanada in your posts. Print the #NotOkay posters, take a picture and post to social media. Join UFCW and YWCA and show your support to end violence by uploading your #NotOkay posting from November 25 to December 10, 2018. The National Day of Remembrance and Action on Violence Against Women, also known informally as White Ribbon Day, is a day commemorated in Canada each December 6, the anniversary of the 1989 École Polytechnique massacre, in which an armed student, Marc Lépine, murdered fourteen women and injured ten others in the name of "fighting feminism". Canadian flags on all federal buildings – including the Peace Tower on Parliament Hill in Ottawa, Ontario – are flown at half-mast on December 6. Canadians are encouraged to observe a minute of silence on December 6 and to wear a white ribbon (or a purple ribbon) as a commitment to end violence against women. For more information on what you can do to end violence against women go to http://www.rosecampaign.ca/. 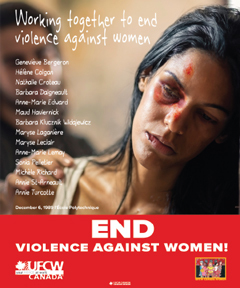 For more information on violence against women and UFCW Canada materials click here. 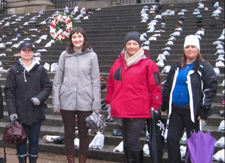 In 2002, a small group of committed Vancouver citizens created the Shoe Memorial in memory of the December 6th murders in L’Ecole Polytechnique. They wanted to create a one-day visual display of all women who lost their lives to violence in Canada, so that they could be remembered.